How to Register as a Partner on MYSUN? MYSUN takes immense pride in bringing value-added services for all those who are in the solar industry. 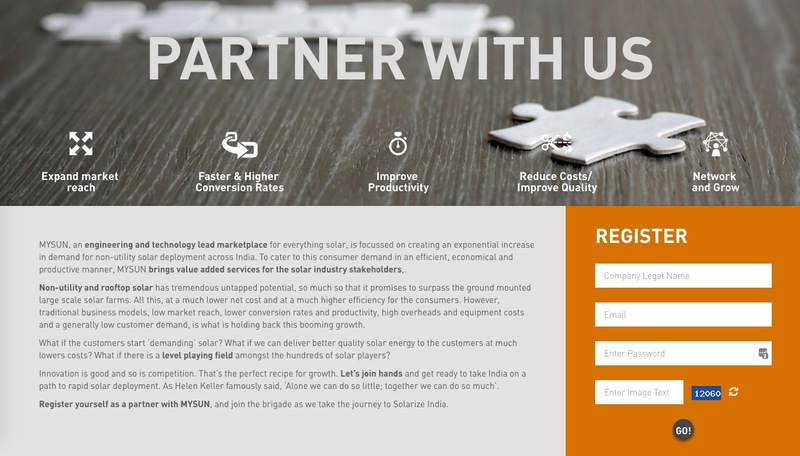 Being a neutral platform, MYSUN finds itself uniquely positioned where not only can it help a vast population of the country take their first steps towards going solar but also provide tremendous value to its partners by lowering their cost of customer acquisition. Beyond the acquisition, we help our partners profile the users through our state of the art algorithms that factor in information gathered during our meticulous site visits and detailed socio-financial profiling. This allows our partners, not just to expand their business by having access to interested customers, but also just the right information about each customer catering to their business individually. Becoming a partner on MYSUN brings a host of benefits. Depending upon whether you are looking at our marketplace driven offerings that are aimed at enhancing the business growth of our partners, or you are looking at the consulting and strategy offerings, you can go ahead and register with us. This is a simple two step process and we have broken it down in detail for you. The first step requires you to be on the right page. 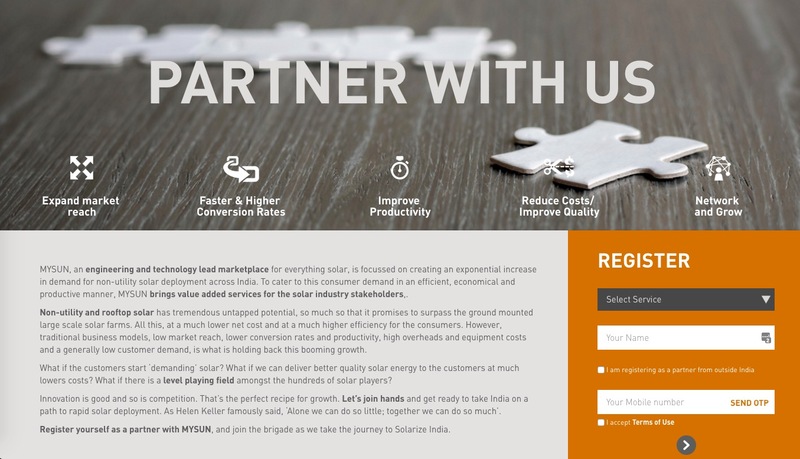 To be able to Register yourself as a partner on MYSUN, you will need to be on the 'Partner with Us' page here. When you are here, you will see a form in the box on the right-hand side the page that needs some attention. Select the service that your company provides as listed in the dropdown. If you are a partner registering from outside India, click on the appropriate box stating you are registering from outside India. Input your mobile number and click in send OTP. Input the legal name of your company in the first field. The second field requires your personal E-Mail ID. You will need to use this to log in to MYSUN. Click on Go and you are registered as a partner on MYSUN, which will be confirmed by an SMS and an E-Mail. While this is all that it takes to register as a partner on MYSUN, we need to know a little more about you and your company in order to know you better and filter out leads to customers that would be perfect for your business. This is why after your registration, you will be required to complete your profile by logging in here. You will be requested for details about rooftop projects that you have completed, their capacity, a bit about your company, if you are an MNRE partner, and some basic documents like your PAN card and a canceled cheque. Once your profile is completed with all the mandatory fields, the process is complete and you are ready to reap the benefits of being a MYSUN partner.